Pictured left to right: Chairman Ardeth Bannon; Ashleigh Hildreth, Hart High School; Jenny Appledorn, Mason County Eastern High School; Jocee Schwass, Mason County Central High School; Katie Levandowski, Cedar Springs High School; Marah Olmstead, Shelby High School; Regent Melinda Young. Not pictured: Brandon Wiklanski, Alanson High School. 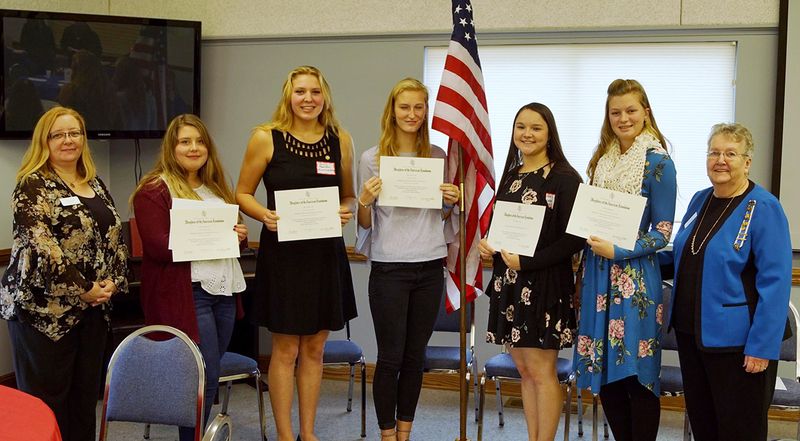 MEARS – The Michigan Dunes Chapter of the Daughters of the American Revolution hosted a reception at the Mears United Methodist Church to honor high school seniors nominated as their school’s DAR Good Citizen. A school must be sponsored by a DAR chapter in order for a student from their school to be nominated. Nominees from Mason County were Jenny Appledorn, Mason County Eastern High School and Jocee Schwass, Mason County Central High School. The winner was Hannah Van Wert from Kent City High School.